A wide selection of performance cricket shoes for bowlers, batsman and all-rounders in stock all year round - including full-spike, half-spike and rubber spikes options. 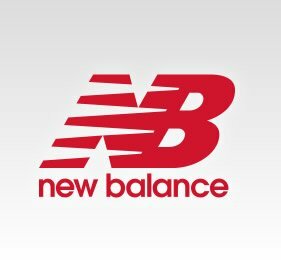 From makes such as adidas, New Balance, Asics and Puma, our selection is bound to help make this season your best yet. Available across both junior and senior sizes. Due to the varied demands of each of cricket's three main disciplines, namely batting, bowling and fielding, the development path for cricket shoes has not always been clear. All three disciplines do benefit enormously from maximised grip on a range of surfaces and in a variety of weather conditions, which naturally led to the adoption of spiked soles. Over the years, manufacturers have often developed cricket shoes whose characteristics suited one or more of the disciplines more accurately. Batting specific cricket shoes have been a regular feature throughout cricket's history, but the focus on added toe protection has in most cases resulted in cricket spikes feeling heavy and cumbersome, which has lead to most cricket shoes being designed for "all-rounders". However, the particular physical impact of fast-bowling has resulted in an ongoing demand for dedicated cricket shoes, commonly referred to as bowling boots. These more specialist forms of cricket footwear support and protect the bowler during the high impact of a full bowling action. The upper section (or vamp) of cricket shoes forms a large proportion of the material either side and on top of the foot helping hold the shoe onto the foot. 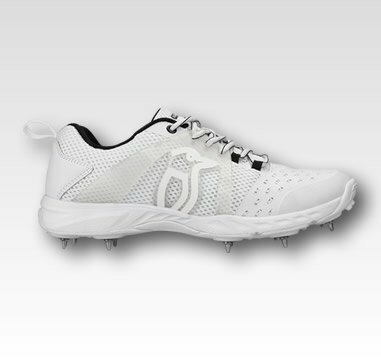 In most cricket shoes, the upper is designed to offer support in key areas whilst offering maximum ventilation for those long hot periods at the crease or in the field. Many brands will also feature additional materials around the toe area to offer increased durability and scuff protection. The majority of cricket shoes are designed in the low-cut style, whereby the shoe finishes below the ankle to offer maximum flexibility. Cricket shoes designed for bowling will often feature a mid or high-cut style designed to offer more support to the ankle during the bowler's delivery and follow through stage, and may offer additional fastenings (or straps) to ensure the foot doesn't move about in the cricket shoe and in turn prevent injury. Sockliners, or footbeds as they are commonly called, is the material which makes direct contact with the sole of the foot. Cricket shoe sockliners often feature extra cushioning for improved comfort, support, control, shape, moisture, or smell of the shoe. Most cricket shoes will feature additional arch and heel supports to maximise support to the foot under a range of actions. Many cricket shoes have removable and replaceable sockliners to allow the wearer to add bespoke support or keep their shoes fresh. The Midsole is the layer in between the outsole and the insole and generally makes up the majority of the sole unit's bulk. The midsole is largely designed for shock absorption and different companies use different materials (or combinations of materials) in different cricket shoes to offer the specific characteristics required by the wearer. For example bowling boots will in most cases offer greater impact protection by incorporating specialists shock absorbing units into the heel of the boot. Some midsoles may feature stiffer materials in specific areas to maximise support, whilst softer materials elsewhere ensure comfort and shock absorption. The heel makes up the bottom rear part of the cricket shoe and is usually made from stiffer materials designed to offer maximum support to the heel of the foot. Most cricket shoes will feature a heel counter, a stiff plastic shield to protect the heel of the shoe and offer greater support to the heel of the foot. 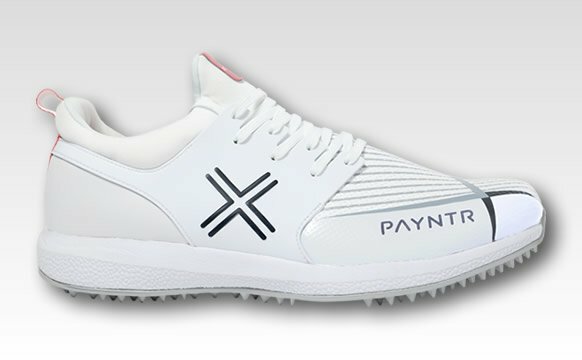 Normally the heel counter is built into the inner part of the cricket shoe, but some manufacturers are starting to add an External Heel Counter to offer even more support and protection. A rigid heel counter is a particularly good feature for those who over pronate. The outsole is the layer in direct contact with the ground. In the case of most cricket shoes, the outsole will be made from a highly durable material such as Polyurethane. 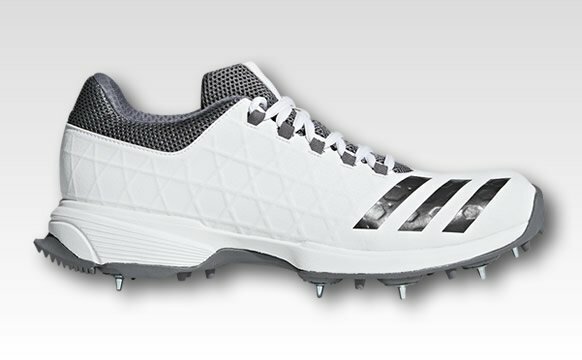 The majority of cricket shoes outsoles will incorporate a spike plate to allow the attachment of spikes, but some cricket shoes designed for use indoors or on synthetic surfaces will often feature a rubber dimple or cleat design, to offer maximum grip without damaging the playing surface. 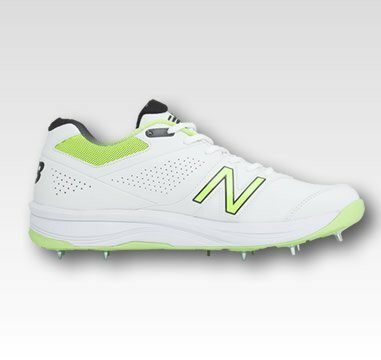 Cricket shoes designed for all round players may also incorporate dimple or cleat features in addition to the spike option in order to ensure grip in all conditions. Bowling boots however, tend to have very flat outsoles to enable impact to be spread over a greater surface area and more support to be offered to the foot. 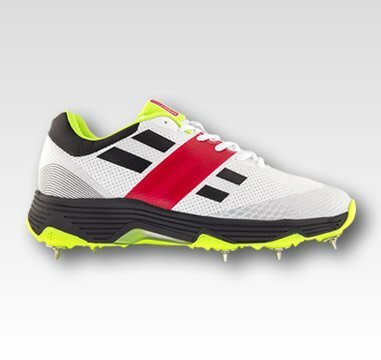 The addition of spikes to cricket shoes offers a marked increase in the grip levels of many cricket shoes, particularly in wet or greasy conditions. 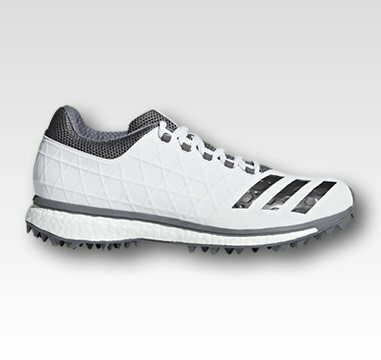 Almost all cricket shoes designed for use outdoors offer the option of adding spikes, but the position, configuration and type of spikes varies significantly between both brands and models. Bowling boots almost always offer 4 spikes on the heel to ensure maximum grip at the point the leading foot plants at delivery, but the number of spikes on the forefoot varies between 6 and 8. 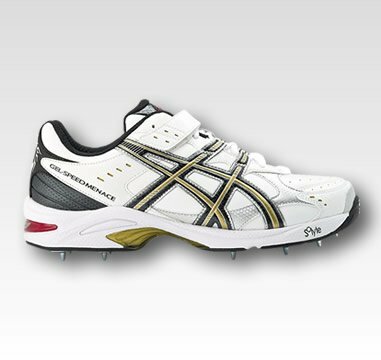 Cricket shoes designed for all rounders offer between 2 and 4 heel spikes and between 5 and 7 forefoot spikes. Sometimes it would seem you can have too much grip though. Batsmen over the years have often complained that wearing spikes on the heels of their cricket shoes when batting can often be detrimental to the speed of their footwork. 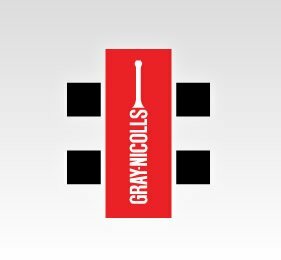 With this in mind many all-round cricket shoes are marketed as "multi-function", which allows the replacement of the traditional steel spikes, which offer greatest grip, with plastic stud-like replacements for use in drier conditions. Some cricket shoes aimed more directly at batsmen do away entirely with the heel spikes to reduce weight and improve comfort. A number of brands incorporate a feature designed to increase strength and stability whilst minimising torsional flex (or twisting) of the mid and outsole, and helping to reduce injuries. Made from stiff yet flexible materials these features also help support the arches of the foot and help those with over pronation. 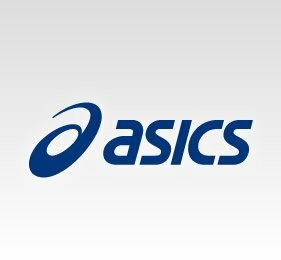 Asics refer to this feature as a Trusstic System, while adidas call it a Torsion Bar. Although these feature may look slightly different they largely perform the same function. The way that the upper part of the cricket shoe is attached to the midsole can be achieved using one of three different techniques called slip lasting, board lasting and partial or combination lasting. In slip lasting, the upper materials of the cricket shoe (the part that fits over the top of your foot) are pulled over the last and glued or stitched directly to the midsole. In board lasting, the upper is attached to the bottom of a flexible board atop the midsole. Partial or combination lasting uses the board method in the heel and the slip method in the forefoot. The way to tell what construction a shoe uses is to remove the shoe liner: if you see stitching, the shoe is slip-lasted; if you see a board and no stitching, the shoe is board-lasted. Board-lasted shoe makes for a more rigid and stable cricket shoe for individuals who over or under pronate, or who wear orthotics. Slip-lasted shoes are good for those who have rigid feet and need more freedom of motion; it also makes for a lighter cricket shoe. The combination last, of course, provides the benefits of both worlds by providing stability in the heel and flexibility in the forefoot. Although leather was once the core material for the production of cricket shoes, its use has continued to fall slowly being replaced by synthetic materials. 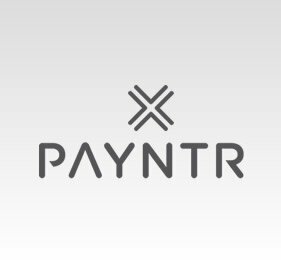 This long term reduction has mainly been due to the increased relative cost of real leather as synthetics have become cheaper. At this point leather is rarely found in cricket shoes, with the exception of small amounts in some high end cricket shoes, particularly bowling boots, where the emphasis is on strength and durability rather than ventilation and weight reduction. 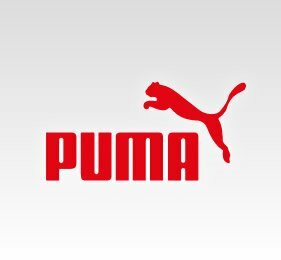 Polyurethane or a slight variation on it Thermoplastic Polyurethane (TPU) is used in a large variety of different ways in the construction of cricket shoes. PU is often combined with cloth to form breathable synthetic leather and combined with some PVC based synthetic leathers is the material that forms the majority of cricket shoes uppers. A variety of PU based materials are also used to provide extra support or padding in many cricket shoes such as heel counters and torsion systems. Although it is not specified by adidas, protective adiTuff material may well be PU based. In the search for strong yet lightweight and breathable materials for use in cricket shoes has often resulted in the use of PU and Nylon based mesh materials. The use of these mesh products has meant that many cricket shoes can be much lighter, offer the same protection and yet offer vastly increased ventilation and comfort. Ethylene-Vinyl Acetate (EVA) also known as expanded rubber or foam rubber and is often used as a shock absorber within cricket shoes midsoles. EVA is chosen in addition to its shock absorption characteristics because of a number of different properties including its light weight, ease of moulding, lack of odor, glossy finish, water proof, UV resistance and low cost. Normally EVA is moulded using an injection moulding technique, but can also be moulded using a high temperature compression moulding which creates a slightly different material with many of the same characteristics but with a higher density. This compression moulded material is commonly referred to as Phylon and is the preference of some brands including Nike for performance midsoles. SpeVa is a midsole is a material developed from EVA by Asics that improves bounce back characteristics and decreases midsole breakdown when running. Some of the features that this material provides include: Better shock dispersion, improves durability. SpEVA can also be incorporated into the shoe in an extra layer known as the lasting. SpEVA is available in three different densities (45 / 55 / 65 degree) which offer varying levels of cushioning and stiffness, with 45 density for high cushion and flexibility, 55 density for increased stiffness to boost the spring rate, and 65 density for increased stiffness thus limiting midsole deformation. SpEVA is often used as a material to replace the board in the board-lasting and combination-lasting process to create a dual density midsole, combining the properties of the different materials to create enhanced characteristics. Solyte another material unique to Asics, offers the opportunity for an even lighter cricket shoe midsoles than SpEva without losing any of the other characteristics. Some of the benefits of using Solyte include: more cushioning, durablity, responsive and of course lightweight. Solyte is also available in three different densities (45 / 55 / 65 degree) which offer varying levels of cushioning and stiffness. Solyte can also be used as a material to replace the board in the board-lasting and combination-lasting process to create a dual density midsole, combining the properties of the different materials to create enhanced characteristics. Pebax is the tradename for Polyether Block Amide (PEBA) and is a high performance thermoplastic elastomer known for its superior mechanical and dynamic properties. Pebax is the material of choice for damping system components and outsoles of some high end cricket shoes , where it is appreciated for its low density, damping properties, energy return and flexibility. Vectran is an aromatic polyester with very similar properties to Kevlar, including a very high tensile strength to weight ratio and is used to strengthen ropes and forms part of the material used to make NASA space suits. Nike have incorporated Vectran into its Flywire thread, which due to its incredible strength, allows cricket shoes to be designed with maximum support and minimum weight. Flywire fibres can be used both as a simple bonding material as well as being woven into other materials to offer extra strength and support. 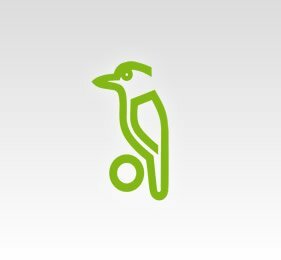 adiPrene is a family of Polyurethanes developed by adidas, that depending on the curing agent, concentration and some variations of pre-polymers, can be modified to feature different characteristics. adiPrene normally refers to the high density foam like material which offers fantastic shock absorption and is often featured in the heels of cricket shoes, particularly bowling boots specifically for that purpose. adiPrene+ offers greater bounce back and can be used in the forefoot of some cricket shoes to offer increased comfort, longer wear and increased durability. Zoom Air is Nike's premium air shock absorption technology whereby a network of thread, plastic and pressurized gas within a cricket shoe's midsole unit converts the force of the wearers impact, absorbing it, and refracting the same stress which helps the Zoom insert retain its shape and buoyancy. Unlike other Nike's other air based technology Zoom Air is different in that it can be offered in a very low profile allowing the wearer's feet to be much closer to the ground allowing for greater feel and responsiveness. BOOST is adidas’ most innovative cushioning technology using a material called thermoplastic polyurethane (TPU) that compresses under pressure for better shock absorption and instantly bounces back to its original shape. BOOST foam is believed to offer the highest energy return of any sole material on the market, delivering better, more consistent performance. Fortunately cricket shoes adhere to normal international shoe sizing standards which should allow you to easily select your cricket shoes based on the size of your other shoes. Please bear in mind that many players choose to either wear two pairs of socks or one particularly thick pair socks while playing cricket for added comfort whilst playing cricket. In some cases this will require a cricket shoes a half size larger than your regular shoes. based on both retailer and player experiences we would also like to point out that certain brands consistently deviate from what we consider standard sizing. 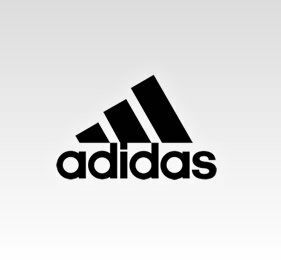 adidas shoes tend to be somewhat thinner and up to half a size smaller than standard sizes, while Nike is often wider and up to half a size larger than standard sizes. 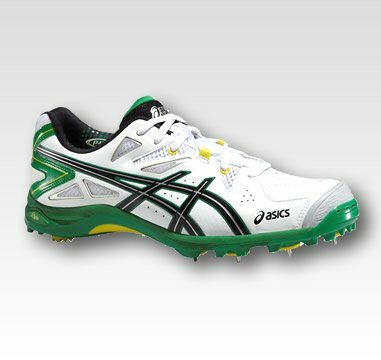 When deciding which cricket shoes are your best option, the ultimate decision almost always comes down to budget. In almost all cases, any cricket shoe from a reputable brand is more than capable of offering improved performance and support for the majority of amateur cricketers. We would therefore almost always recommend that the best fitting, most comfortable shoe within your budget, is the one you should go for, as comfort is one of the key elements that should improve as you spend more. There are however, a number of factors that should be considered. Firstly, if you are a bowler with a particularly high-impact action we would strongly recommend a pair of dedicated bowling boots as they are likely to offer additional support and shock absorption that will prevent injury and most likely prolong your cricking career. As you go up through the ranges of dedicated bowling boots you will see the introduction of materials that offer better shock absorption, or better support, are lighter in weight, or combine better shock absorption or better support with reduced weight. Cricket shoes designed for the batsman or "all-rounder" will also follow a similar path. As you go up through the ranges you will see the introduction of materials that offer improved support, weight reduction, or combine increased support with reduced weight. You will then need to decide which tread style you prefer from full spike, half spike or multi-function. 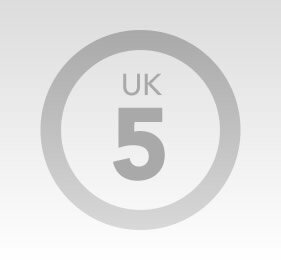 If you don't have a preference, we would recommend the multi-function option as it will allow you to adapt you shoes to different conditions or even your own changing preferences over time. Next you will need to take into account any nuances specific to your feet such as whether you have particularly wide or thin feet, or suffer from over or under pronation as certain brands (see sizing) or models will prove more suitable for particular personal conditions. If you are unsure we recommend you consult a cricket footwear specialist or alternatively do your own detailed research online. The last aspect to consider is the age of the intended wearer. Broadly speaking, children's feet will grow up to 1cm per year (roughly 2 full sizes), between the ages of 6 and 12. From ages 12 to 17 feet generally grow a further 10% in boys and 2% in girls. Therefore under the age of 12 it may not be worth investing in a pair of expensive cricket shoes as they may out grow them in a matter of weeks. Untie and loosen your laces before removing your cricket shoes as failure to do so will over time reduce the support offered by the heel of your shoes. Remove and dirt and grass from the soles of your cricket shoes immediately after use by banging them together or brushing with a stiff bristled brush. After use in wet conditions DO NOT leave in your boot bag, but place in cool dry area out of direct sunlight. Extended exposure to heat can damage some materials, particularly leather. Direct sunlight can cause the break down and discolouration of many synthetic materials. Wash your cricket shoes in warm, NOT HOT water as some materials may warp under high temperatures. We strongly recommend NEVER putting your cricket shoes in the washing machine, but if they've reached that stage where there is no other option, avoid any temperature above 30 degrees Celsius as your shoes may shrink or warp in unexpected ways to a point where they become unwearable.